Blakat is the name of one of the Seven Sisters of the mythos of Babel, known as the Goddess of Conflict, often as the Goddess of Murder, and sometimes invoked as a Goddess of War. She is a matron of mercenaries, and is also seen as a matron of bandits and brigands, for in legend she is depicted as frequently being envious of others' possessions and taking them by force. Blakat is also regarded as the "Mad Goddess", and is strongly associated with insanity at times. At times, there have been attempts by outsiders to portray her favorably as a matron of soldiers, but this is contrary to the Babelite mythos, in that they see the universe as naturally chaotic and unfair, and thus their gods and goddesses are fundamentally flawed and are appeased more than truly worshipped. 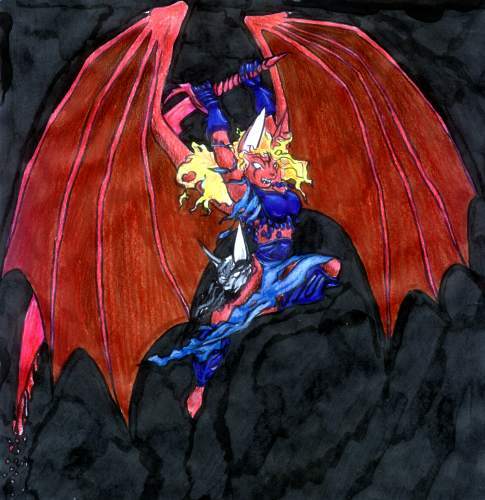 Blakat is depicted as a wild-haired, wild-eyed, mad-looking female Eeee with a fierce countenance, in torn clothes and pieces of mismatched armor, often carrying a cruel-looking weapon of exotic shape. She is frequently (but not always) depicted as having red hair and/or red fur; she is said to bathe in the blood of her enemies. Blakat is also the name of a mountain in the range of the "Seven Sisters" near Mount Dronnel, outside the city of Babel. It is home to a shrine devoted to her name, and it is said that every pebble on the mountain represents a drop of blood shed in her name. Priestesses of Blakat are taught some martial skills, and many of them serve as mercenaries for those who make especially large "donations" to the sisterhood. Of the Yodhblakat (Daughters of Blakat), many are trained to become the Slakash - the Poison Women - warrior priestesses who are best known for their practice of working themselves into berserk frenzies when entering combat. The rune that represents Blakat in Babelite script is also known as "The Dagger", though it's often given a more descriptive adjective, such as "The Bloody Dagger" or "The Crimson Dagger". Blitzheim is the capitol of Chronotopia, a country in the region of Nordika on the northern end of the continent of Ai. It is aptly known as the "Home of Lightning", being generally believed to have the highest incidence of lightning strikes anywhere on Sinai outside of a Forbidden Zone. Among other things, Blitzheim is known for its great number of clock towers (all meticulously kept in sync), and the best fire response system on Sinai (and plenty of reasons to need one). One of the more distasteful varieties of "fauna" to be found in the jungle regions of the Savan and parts of the plains is the dreaded Blood Fly. These creatures have an uncanny ability to scent blood as far as a mile away, and will arrive in swarms in a matter of minutes (or less). In a sense, they serve as "janitors" of the jungle, But, they are a genuine hazard to wounded creatures. They swarm over fallen victims, blanketing them and cramming into every available orifice, killing by suffocation. After that ... it's just another meal. The best defense against Blood Flies (other than simply never bleeding) is to keep moving. They track by scent, not sight, so even if a swarm is in the same clearing, there is still hope to get moving, and hope to find water. Getting into water is the second method -- On the one hand, washing away blood helps. On the other, Blood Flies drown very easily, and the best way to save a victim covered with the flies is to dunk him quickly. 1) A large and distinctly bounded Forbidden Zone in a mountainous region bordering the northern lands of Chronotopia on the continent of Ai. Whereas many Forbidden Zones are simply a hazard to passing airships, this one exemplifies magic at its (hopefully) wildest, the land twisted into a nightmarish horror, where it is hard to tell what is a creature, what is a building, what is a plant, or what much of anything is with any degree of certainty, as it all tends to blend and warp together. Locations of note within Bosch's borders would include the Crystal Tower, the Plains of Change (and Citadel of Change), the Cascades of Fire ... and a lone oasis of relative safety, the monastery known as the "Sanctuary of Gears" (or "Sanctuary of Order") located on its western end, connected by a mountain pass to Gallis. 2) The language of the nation of Chronotopia, a fairly "industrialized" land on the surface of Sinai, on the northern part of Ai, bordering Titania, the Vykarin Wastes and Sylvania. As for why the language of Chronotopia would be named after its greatest enemy, only the monk historians of the Celestial Order might know for sure, but legends hint at a time when Bosch was not quite the land of horrors that it is now. The head council of the Temple of Rephidim is known as "The Bridge", consisting of officers who are above the three primary branches of the Temple: the Legislative (Priesthood, Audit), Executive (Inquisition, Guard) and Internal (Technopriest) branches. The Bridge, in turn, is governed by the Captain-Astromancer. Bromthen Forest-Hogs are found in the jungles on the mountainous edge of the Savan Territories, being very sizeable boar-like creatures with even more sizeable tusks. Full-grown boars easily reach 3 to 4 feet tall at the shoulder, and it is not known just how large their tusks might grow ... it would seem that they simply keep growing until such a point as they are so unseemly that the creature cannot carry its own weight, or else they are chipped and broken during fights. Bromthens are hunted for meat and for the ivory of their horns, but they are occasionally useful for hunting gigantic Pumpkin Truffles that can be found in the Savan jungles. This oversized "truffle", the size of a pumpkin as the name suggests, is found exclusively in the jungles of the Savan. It is associated with the Bromthen Forest-Hog, which is its primary "predator", for the oversized boar-like creatures are unsurpassed at sniffing out and digging up these growths with their enormous tusks. In appearance, the truffle looks like a giant, hairy pumpkin. The outer husk is thick and durable, requiring some effort to break. The inside consists of nodules of a carob-like substance. Pumpkin truffles are sometimes sought out as delicacies, but their relative rarity and the lack of ease in finding them makes them even more a rarity on anyone's dinner plate (except, perhaps, that of a Bromthen Forest-Hog...). Bromthen is one of the smaller territories of Savan, covering an irregular patch of mountains, foothills, swamps and jungle on the western coast. It is best known for the "Bromthen Forest-Hog", although the Forest Hog is not confined to its borders. Along the coastline, the land is very level and low, such that tides will flood many square kilometers during certain seasons. During this time, land-bound creatures will congregate in "islands" formed by debris caught about the bases of cageroot trees, and larger mounds of earth that remain more or less dry in the deluge (even though the water may only be a few inches deep in most of the areas affected). There are several varieties of vegetation on Sinai that disperse their seeds and seedlings by forming natural "balloons" filled with lighter-than-air gases. The Bubble-Berry Bush is one of these. Sections of it grow large translucent "berries" filled with gas, and eventually the clumps of vegetation break off, floating into the air. Eventually the gases dissipate, hopefully before the seedling dies from lack of nourishment from the ground, and the cluster will descend far away. Bubble Berries are sometimes sought after as an amusement, for children of many races find it enjoyable to get a cluster of the "bubbles" and pop them. Burrowbits are subterranean creatures that, by appearance, resemble moles with extremely elongated bodies, no hindlegs, and very large foreclaws that act as scoops, capable of burrowing through earth or sand at a remarkably fast pace. Despite the appearance, these creatures are not mammalian. In fact, they are not even vertebrates. They can reach sizes of up to four feet in length. One noteworthy feature of the burrowbit is its ability to store extra food in large sacks that open at its "mouth", and run along the length of its body. It feeds mostly on roots and fungi, and thus these are primarily stored there. If attacked by a predator, the burrowbit follows one of three reactions. First, if it is relatively easy, the burrowbit will simply retreat into its hole and flee. Second, if it is completely cornered, it may attempt to fight, but burrowbits are hardly impressive for their ferocity. Third, however, the burrowbit is capable of contracting its body and forceably expelling the contents of its food pouches and then fleeing. Many times, a food-seeking predator will stop to investigate the expelled food first, before attempting pursuit. This latter tactic, while mostly successful as a last-ditch method, is actually somewhat flawed ... because the Gooshurms seem specially adapted in their behaviors to exploit this feature of the burrowbit. They seek out the small creature during its rare surface excursions, burst out, and whip it with their semi-prehensile tongues. This is usually sufficient to prompt the burrowbit to expel its store and skitter away like the dickens ... while the gooshurm has a snack. Cageroots are trees that get their name from how their roots are partially exposed, forming a "cage" in the hollow area underneath them before they join into a trunk. Cageroots are particularly gnarled and twisted trees, and the size of the "cage" may vary greatly -- dependent upon various factors, including the age of the tree, and the amount of flooding likely in the area. They tend to be found in swamps and other fairly damp areas, rather than in more arid regions. The "cages" tend to collect debris (such as fallen leaves, or dirt moved by floodwaters), and are often home to a variety of creatures that may build their homes there, due to the partial protection afforded by the roots. Candlemass is a holiday celebrated in Rephidim on what would correspond to March 15th each year on our calendar. On this day, candles are lit and flowers are worn by girls -- or given to their suitors. Cantrips are the simplest class of magical incantations, almost invariably performing a task that is devoid of any practical value (except perhaps minor amusement) and/or could be accomplished by more mundane means with little difficulty. These are the incantations that are to be mastered by mage apprentices before more complex proper spells and rituals are learned. Unlike rituals, cantrips do not require such preparations as magical circles, and usually don't require material components. On the surface of Sinai, the average cantrip takes about fifteen seconds to cast by the average trained mage. The same cantrip would take four times as long (that is, about one minute) to cast in Rephidim, due to the weaker state of magical energies at that elevation.